Boom arm LED desk lamp provides a "warm" full spectrum illumination that most closely resembles natural light for reduced eye strain with excellent color rendering. 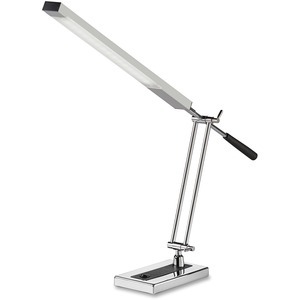 It is adjustable to provide great lighting wherever you need it over a large area. It saves you dollars by reducing your energy consumption and not needing to replace a bulb. It is rated for 30,000 hours. No mercury or harmful chemicals. Offers metal and acrylic construction with weighted base. Boom arm is 28-3/4". LED cluster draws just 5.3 watts.